Later on we plan on releasing new wines, our selection called the Crus Etoilés. These wines will be exceptional wine terroir combined with exceptional winemaker’s work. We believe Winestar® can also bring exposure to these regions which are elitst and that every consumer can enjoy great wine in an affordable format. Finally we made sure that the wines in cans are not more expensive thn those in a bottle. This is possible because we select premium wines so the packaging costs become negligeable. Wine is a live and sensitive product. 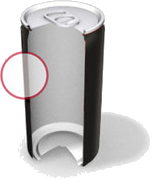 The can is the ideal packaging because it perfectly protects the wine against light, oxygen and humidity. Our technology prevents any exchange between the wine and the metal thanks to a specific coating, result of years in R&D. And of course, your wine will never have a cork taste ! Finally the aluminium can is 100% recyclable indefinitely with little energy. Its light weight and compact size translate into significant reduction of its carbon footprint, and savings for the distributors as one transport twice as much wine in cans than in bottles for the same weight/volume !